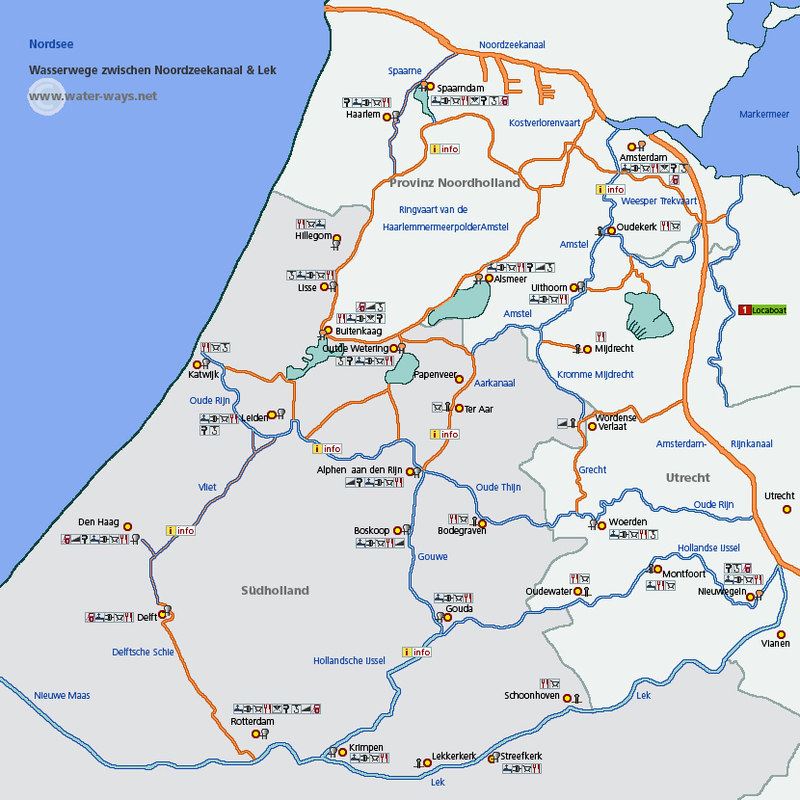 Map of the south Holland waterways. Rotterdam to Haarlem on the Delftse Schie, Rijn-Schiekanaal, Zijl, Kager-plassen, the Spaarne and Ringvaart van de Haarlemmemeerpolder (what a mouthful): 66 kilometres, 1 lock, 31 lift/swing bridges. We almost follow the North Sea coastline but luckily we are on an inland canal. Haarlem to Amsterdam continuing on the Ringvaart via Halfweg across theNieuwe Meer, along the Schinkel and briefly into the Amsterdam outer harbour: 36 kilometres, 1 lock, 17 lift/swing bridges. When we signed off in our last blog we were almost in Rotterdam. We knew it would be a bit rough coming along the heavy commercial waterways from Dordrecht: the Oude Mass, the Noord and then the Nieuwe Mass which we were familiar with. We had two very hectic junctions and then it was relatively easy-going. When we arrived in Rotterdam I vacuumed out perhaps three buckets of water from our engine hold .. so a three-bucket trip is not bad. A dorade box now fitted inside our engine hold over the air vents. 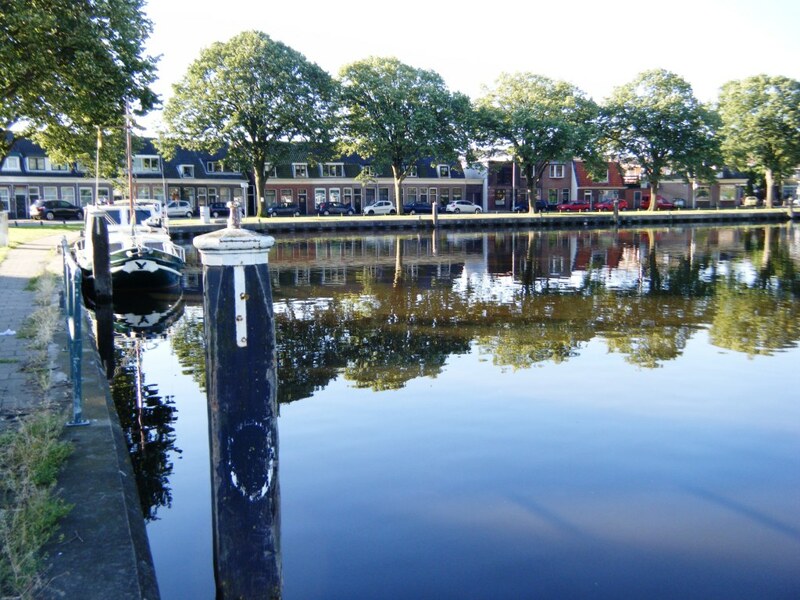 We’re now in Weesp (near Amsterdam) having those dorade boxes fitted, as discussed in our last blog, which should prevent most of this water coming in through the air vents. In Rotterdam we chose to moor once again in Coolhaven (read about Rotterdam harbour here), a large commercial port area inside the Parkhaven lock off the Nieuwe Mass. Coolhaven, our preferred Rotterdam mooring. It’s quite strange to find it so deserted, as it was last year, even at this school holiday, summer time. 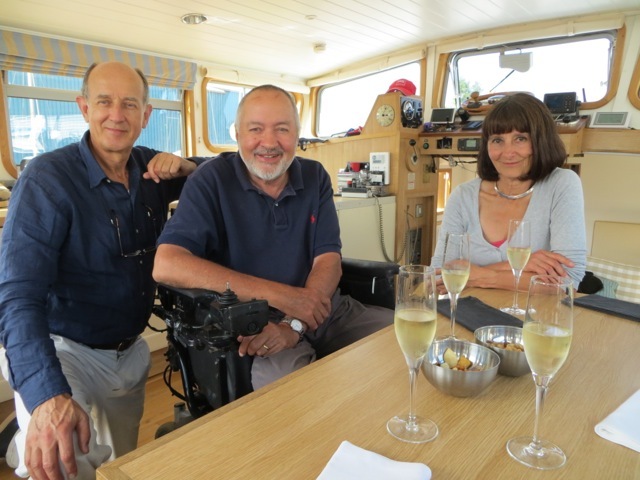 We met up with John, our friend who last year was living on one of the few vessels here, a péniche. One of his skills has been as a paint specialist and so we could show him the nice white-painted roof (last year it was mostly rust) which he approved of. However, he also looked at the blacking which had been done at the same time and like us he was rather shocked at how green it now was: Growing a veritable garden down there under the water making us slower and costing us fuel as well as looking pretty ugly. The ducks enjoy it as in certain harbours we hear them tapping away on our hull in the early hours of the morning to harvest their breakfast. How was it that in less than six months we already had this growth, worse than ever before in fact, after it had been painted with four coats of blacking? We will found out a little later. 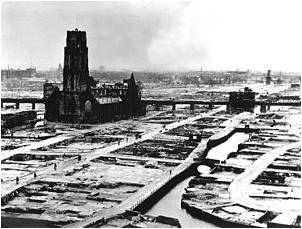 The destruction of Rotterdam in the WWII Luftwaffe bombing, May 1940. 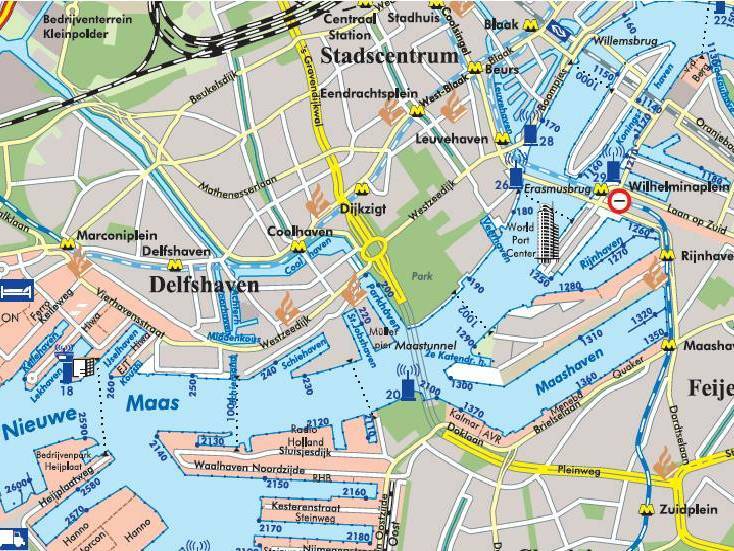 Unlike most of Rotterdam, this area (near Delfshaven) escaped the horrendous bombing by the Luftwaffe on May 14, 1940. 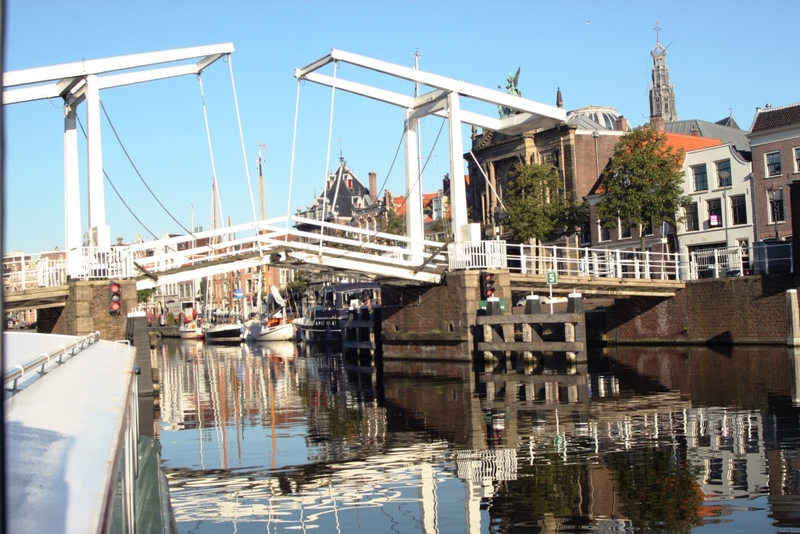 Delfshaven has an interesting history being created to overcome the fact Delft didn’t have a harbour of its own. Back in the late 1300s they didn’t want to pay taxes to the competing city of Rotterdam so they built their own harbour and named it Delfshaven. It was from here in 1620 that the Pilgrim Fathers sailed for Britain in ‘Speedwell ‘ to join up with the ‘Mayflower’ to sail to America. The Mayflower history is well-known but Speedwell never made it beyond Plymouth. The church here at Delfshaven is named after the Pilgrim Fathers: Pelgrimskerk. The lift bridge leaving Coolhaven, with the entrance to Delfshaven to the left. 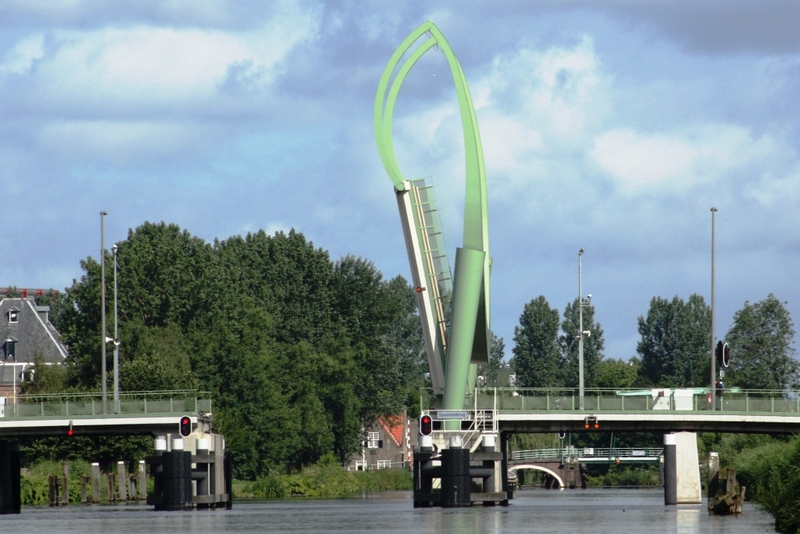 One of the striking lift bridges in southern Holland. From Rotterdam we headed for Haarlem, a city we’d wanted to visit last year when we got as close as Leiden but diverted to Amsterdam. Leiden was our first stop again, around 40 kilometres from Rotterdam which isn’t far but there were at least 14 bridges to be lifted. Eventually we realised we had to take the canvas down (over the stern deck) or there would have been far more. A comfortable height, 2.8 metres, we can pass under easily with our canvas cover taken down. We inched our way slowly under the first 2.8m, and then 2.7 which we’d agreed before was our lowest limit, and then 2.6, heading next for 2.5 as many of them seemed to be this height. We’d forgotten that when we passed this way last year there was no canvas as we’d lost it in the Amsterdam canal! Lesley on the bow and Stewart at the ‘wheel’ as we inch our way beneath a low bridge. The bridges coming into Amsterdam are very low and will not be opened until night-time, so we push on underneath and make it. As usual, when we can, we had rung ahead to ask the Leiden harbour office if we could moor where we did last year, in the commercial section, so that we could have wheelchair access. Yes, it was agreed, that will be fine. Moored at an inaccessible spot before Leiden as the Harbourmaster said no place for us. However, when we arrived at Sumatrabrug lift bridge before the harbour there was an electronic notice board stating ‘Haven Vol’, in other words it was Full and the boat ahead of us turned and went in another direction. We will be fine, we thought, we had organised our mooring. No, over the radio the male voice told us what we could read, the harbour was full. But.. but.. made no difference, we were told it was full and that was that. The almost empty commercial moorings at Leiden, where last year they asked us to moor – this year they wouldn’t allow us in. Greatly deflated we moored at the nearest place available, beside the bridge where there was a working barge (as it was Sunday not working) and had a sad night with no wheelchair access. The following early morning I walked into town to find that the commercial section was as good as empty. We had obviously found the wrong man at the end of the line yesterday. 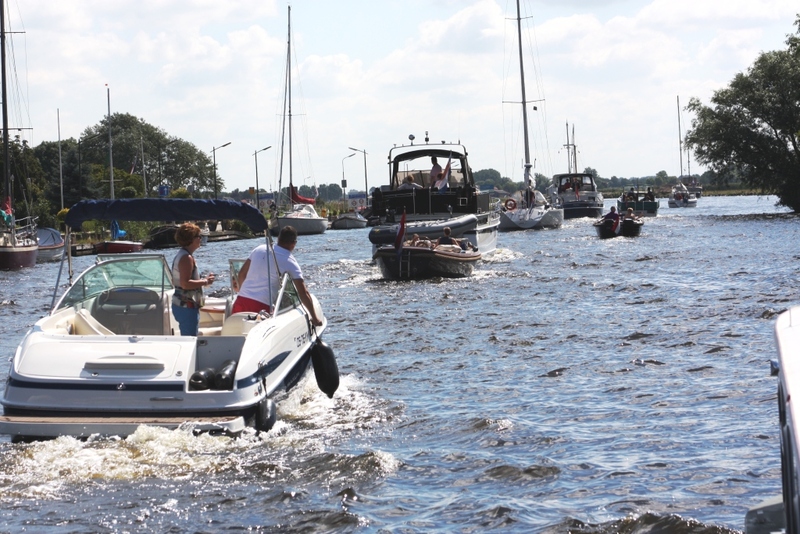 On we went missing out on visiting Leiden, a town we loved, heading for Haarlem via Kaag Island a delightful stop beside the ferry that crosses the channel. 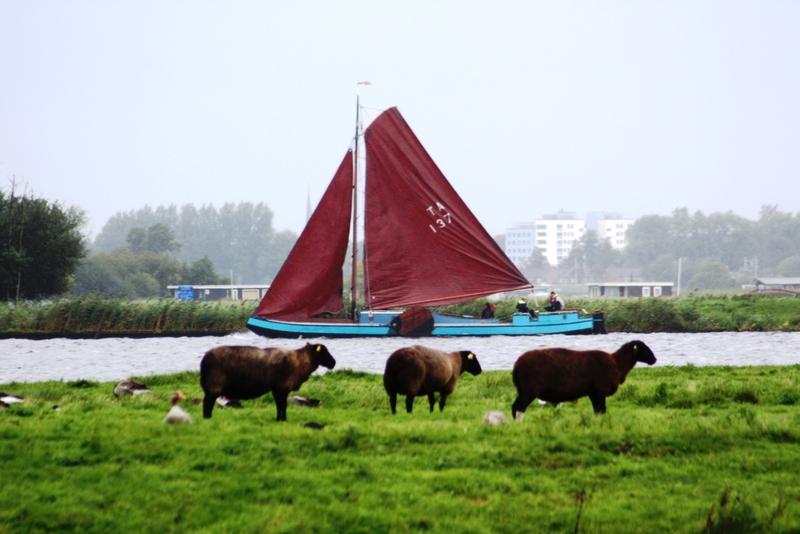 Plenty of sail up around Kaag Island and the Kagerplaasen lakes. The Kaagdorp harbourmaster was extremely helpful and kindly rang the Haarlem harbour office to book a wheelchair accessible mooring for us. To date if the harbourmaster gets involved we are as good as guaranteed a place. 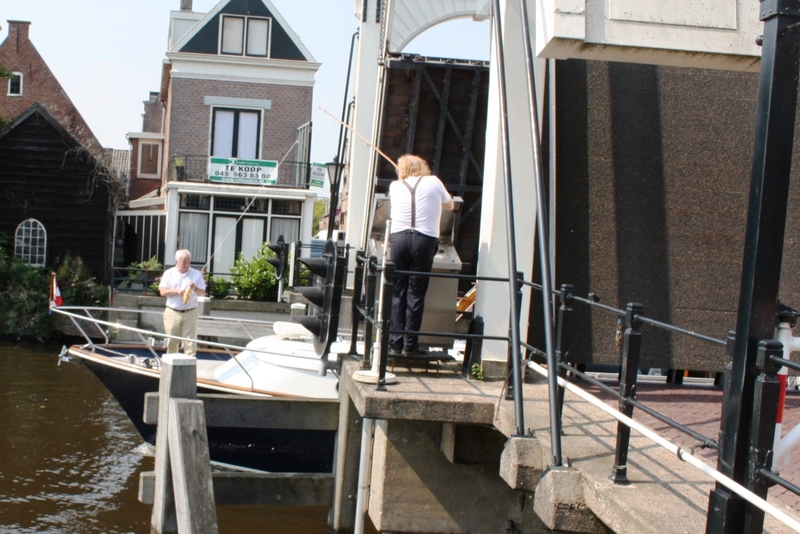 He told us we were to contact the Haarlem harbour office at Warderbrug bridge on arrival. Most days it’s very busy on the waterways; it’s summer and the peak of holiday time. This was a bit odd as we were coming in from the south and this bridge was way through the city to the north. So on entering the city just as we’d passed four or five bridges very smoothly in a synchronised operation with other boats (mostly leaving town as we arrived) we phoned the office to check in. The harbourmaster said “no, no.. you have gone too far. Turn around .. and head for xyz” (a place we couldn’t recognise on our maps). The challenge is often in pronunciation, we forget the letter ‘g’ is pronounced like nothing in English, a guttural ‘ch’. So the Gravestenenbrug which he was telling us to go to (where they’d reserved our place) was pronounced something like Chrafestebrug.. and we couldn’t see it on our map! The heart of Haarlem looking across to the Spaarne and Teylers Museum. We found it with the help of one of the bridge operators and could then clearly see a sign which said “reserved for invalids” or words in Dutch very similar. That’s the first time we have encountered a special mooring reserved for those with a disability. 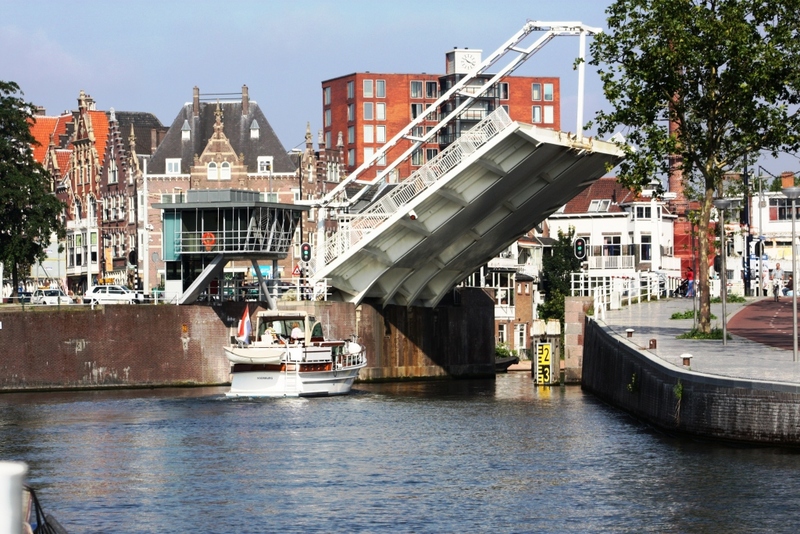 We were right beside a beautiful traditional white-painted bridge (the before mentioned Gravestenenbrug in fact) that lifts from the middle with very steep slopes up and down (and Stewart could manage it with the wheelchair), right in the centre of this wonderful city. 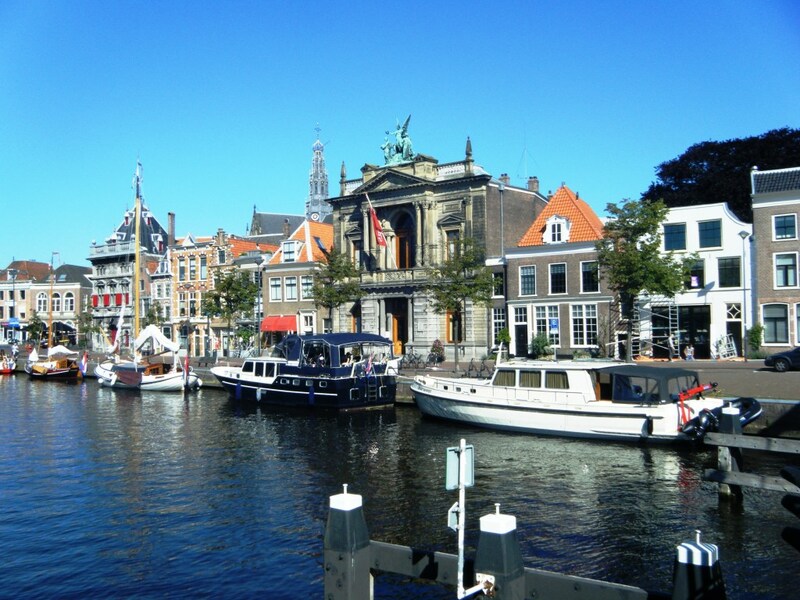 Fellow-boaters have always recommended visiting Haarlem, and we can understand why. Boats can moor all along the banks of the city centre surrounded by beautiful historic buildings, street-side cafes and museums. In particular we loved the Teyler Musuemwhich is the Netherlands first and oldest museum, open to the public since 1784. 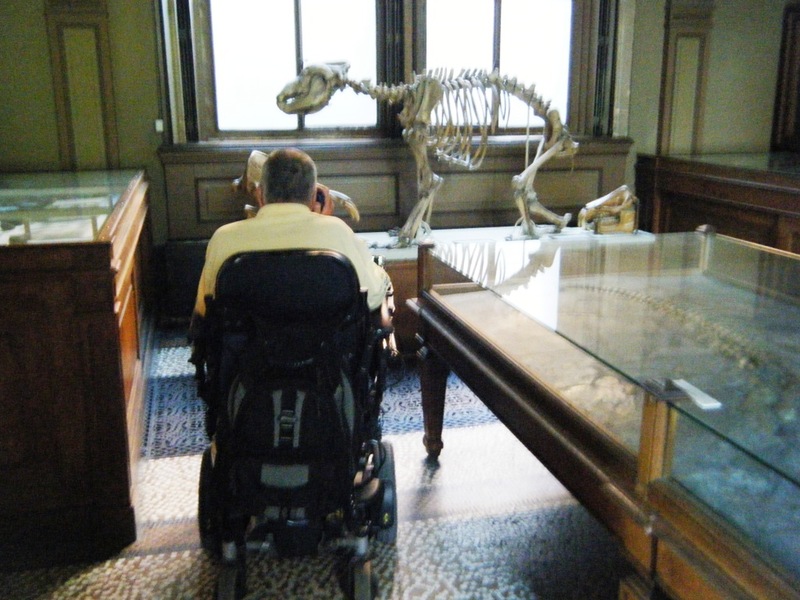 Stewart exploring the intriguing Teylers museum. To quote them: Unique is the historical presentation of its collections, largely unchanged since the late 18th and 19th centuries. 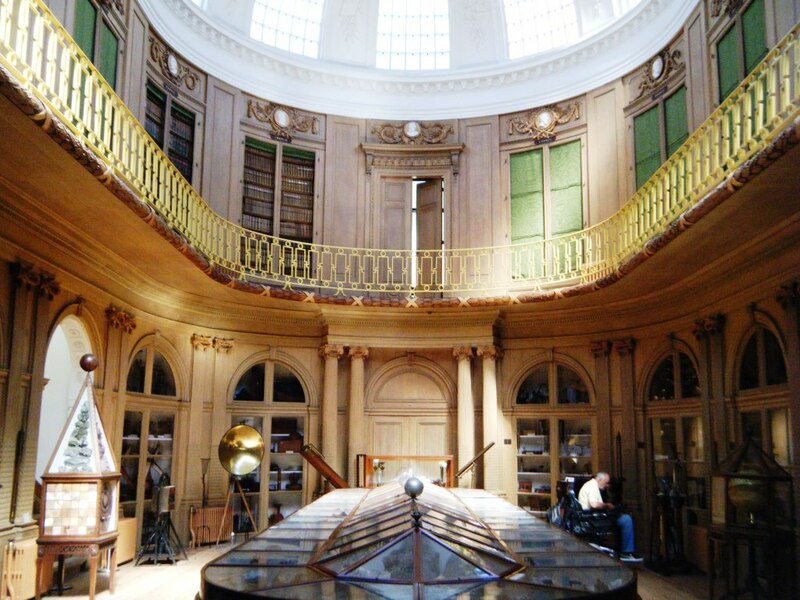 The oval room at Teylers museum, Haarlem. This was the age of the Enlightenment, when the newest scientific experiments were made, when newly excavated fossils were put on show, and when people marvelled at accounts of recent journeys of discovery. We also enjoyed the Frans Hals museum, with a wonderful collection of 16th century paintings with the artist Frans Hals at its centre (of course). Jan Brueghel the Younger’s painting at Frans Hals museum, Satire on Tulip Mania, c. 1640. 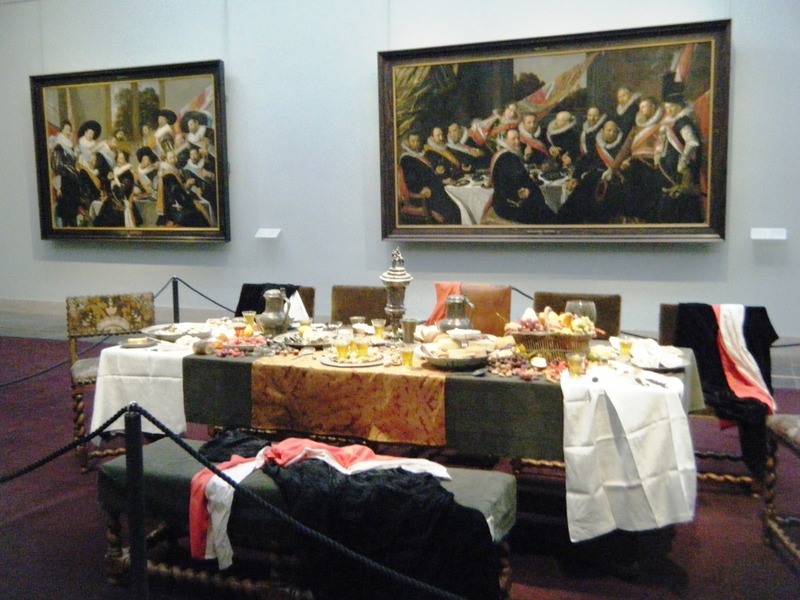 Frans Hals paintings and ‘set’ much as it would have been in the 17th century. 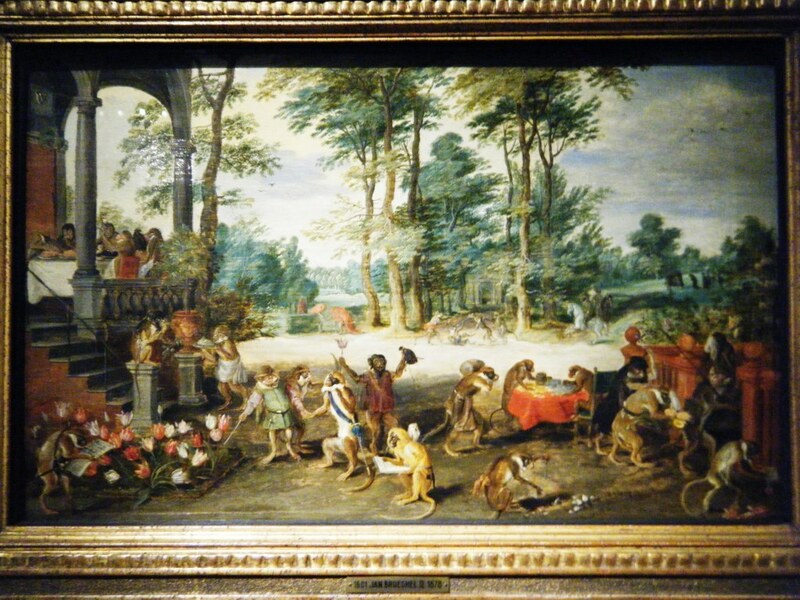 We loved the satire of Jan Brueghel the younger’s painting ‘Tulip Mania’ relating to a period in the Dutch Golden Age when contract prices for bulbs of the recently introduced tulip reached extraordinarily high levels and then suddenly collapsed. At the peak of tulip mania, in February 1637, some single tulip bulbs sold for more than 10 times the annual income of a skilled craftsman. Haarlem was our last but one ‘tourist stop’ before heading into Weesp (as we did last year) for work to be done on our boat at Marco’s (de Bruyn). First we decided on spending the weekend in Amsterdam, a big favourite with us. On the way we had to laugh at a new thing that fishermen do around here, several of them have a hunting horn and blow it along the line as we pass them. Not sure what it’s about but we certainly didn’t have any happy faces or welcoming waves! 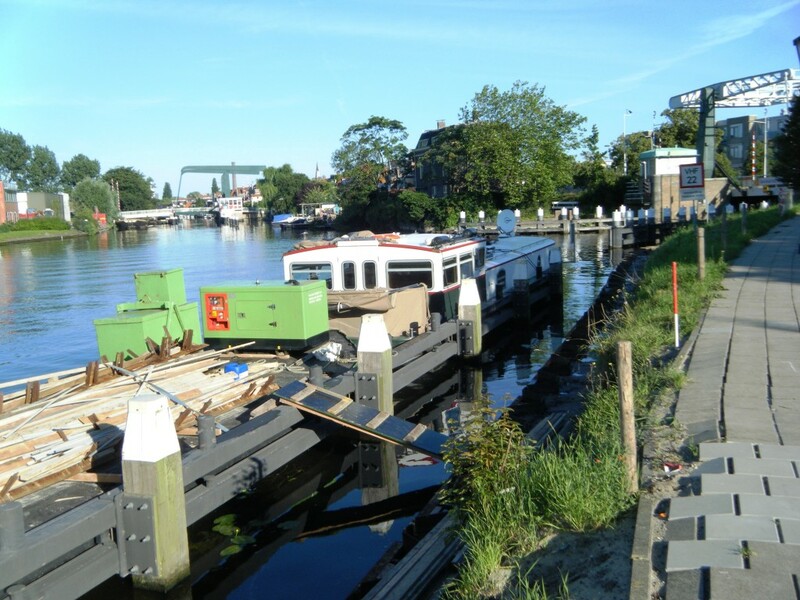 Our mooring at Marco de Bruyn’s yard in Weesp, nicely accessible before we had to be lifted next door. We thoroughly enjoyed our Amsterdam long weekend visiting the Hermitage museum where the special exhibition, ‘impressionism’ included works from the Hermitage St Petersburg’s collection: Different works to those we saw in Paris and elsewhere. The theme was ‘sensation and inspiration’ showing the ground breaking works of the Impressionists alongside the stuffy and very beautifully work of the accepted ‘Salon clique’ the Beaux Arts school. We’re now back in our old spot in the boatyardup on dry land and with no access for Stewart. Endellion with Stewart on board, a wobbly ladder for entrance, sitting in the travel crane ready for painting. Toilet system – converting our original cassette toilet (guest) into an automatic one and taking the water supply from the canal (raw) rather than from our drinking water tank. Steering – reinstalling our Vetus ‘follow-up’ system to give us a third one to reduce repetitive strain on the skipper’s hand (using the joy stick). Fuel tank – with our bigger engine we need more fuel supply and have installed a new third tank with 390 litre capacity (one third increase), making a total of 1,000 litres now available. VHF radio – our second radio had to be sent back to Cobra, this is the second out of three Cobra radios we’ve had problems with. Hurricane heating system – despite replacing all key components and paying a Paris ‘heating specialist’ the cost of a new one, he still couldn’t get it to work. We’re happy to say it is now functioning as it should… (fingers crossed). 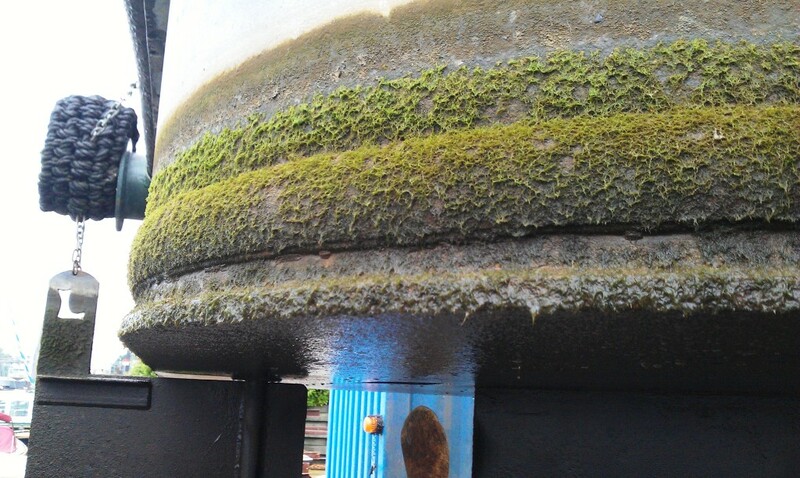 Exhaust pipe – the new wet exhaust pipe was fitted in the old dry exhaust outlet which was high on the port side where it splashed against the quay, back onto the bollard, ropes and deck. It is now over the stern where it should be. Victron electrics system – a system review.. and unfortunately we have to replace all four of our domestic batteries (four years of life is not unreasonable). 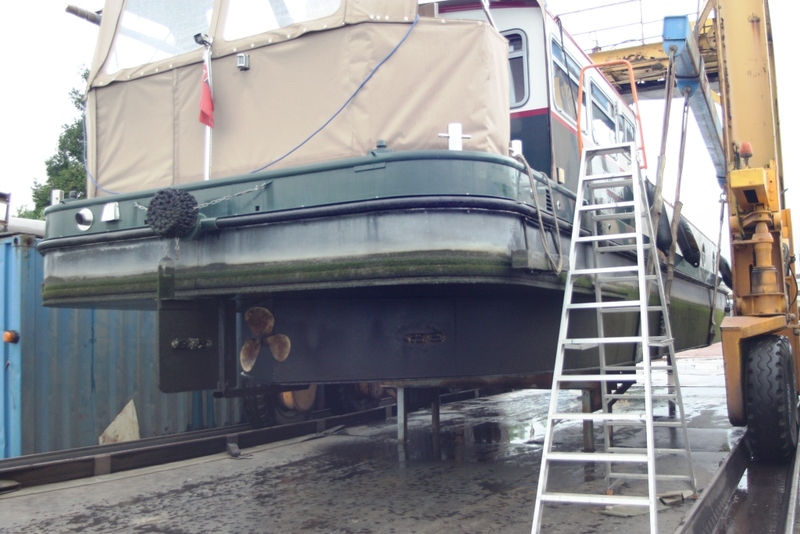 Sound reduction from our engine hold, beneath the wheelhouse and our main living space. A ‘noise killer’ solution in the making we hope. 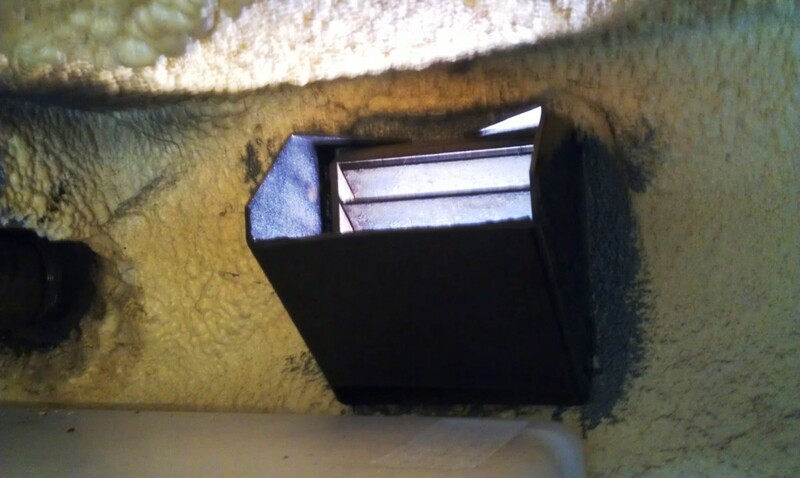 Leaks – water coming in through our air vents and elsewhere. We have now fitted dorade boxes and plugged other vents that are redundant but let in water. The ‘garden’ growing on our bottom, the ducks loved it! Blacking – finding the big work from last year (four layers of blacking) did not include anti-foul. This has meant we had grown a big green blanket below water and so had to start almost from scratch by stripping back, re-priming and blacking with anti-foul. 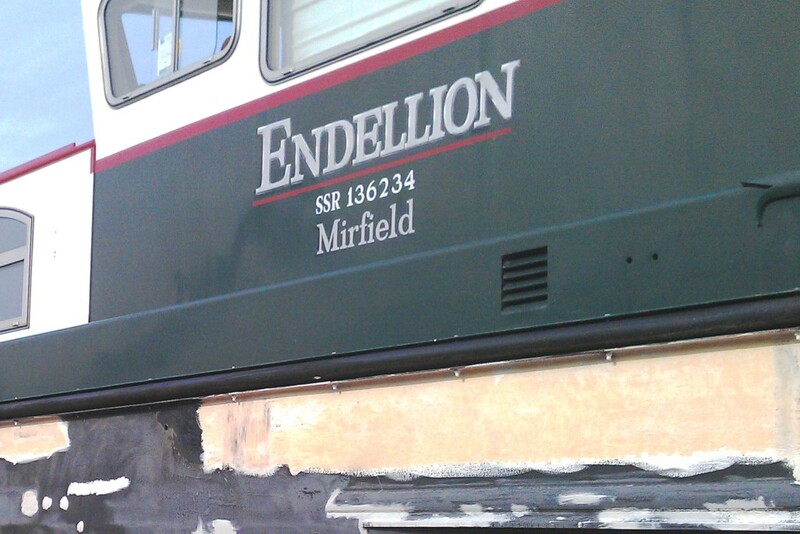 Endellion up on blocks, a patchwork of sanding and priming before painting. You can see the external vent which lets water in, now with a dorade box fitted inside. Hopefully we will be dry from now on. 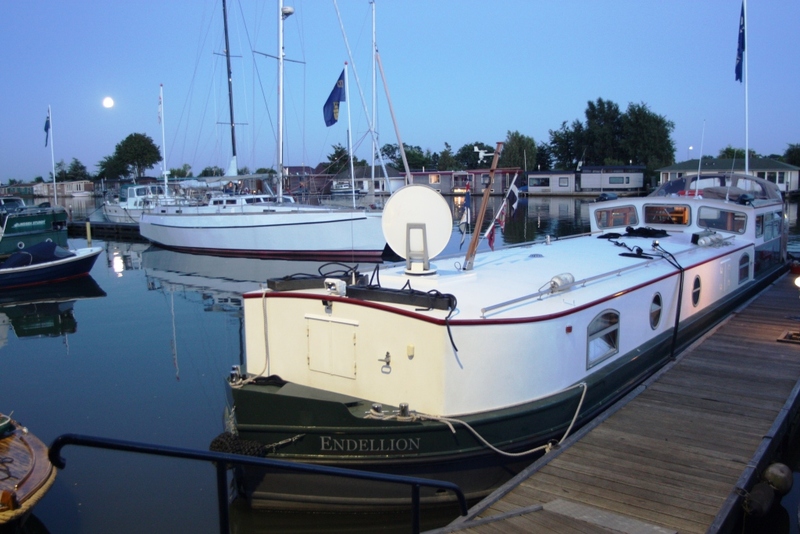 Air conditioning – has not performed in the wheelhouse, an old problem still to be addressed. Propeller – a slight dent being straightened (or curved), probably from a submerged log. Rudder direction – calibrating the indicator so straight ahead is not at a 25 degree angle! It’s a long list and there are many small jobs not shown. 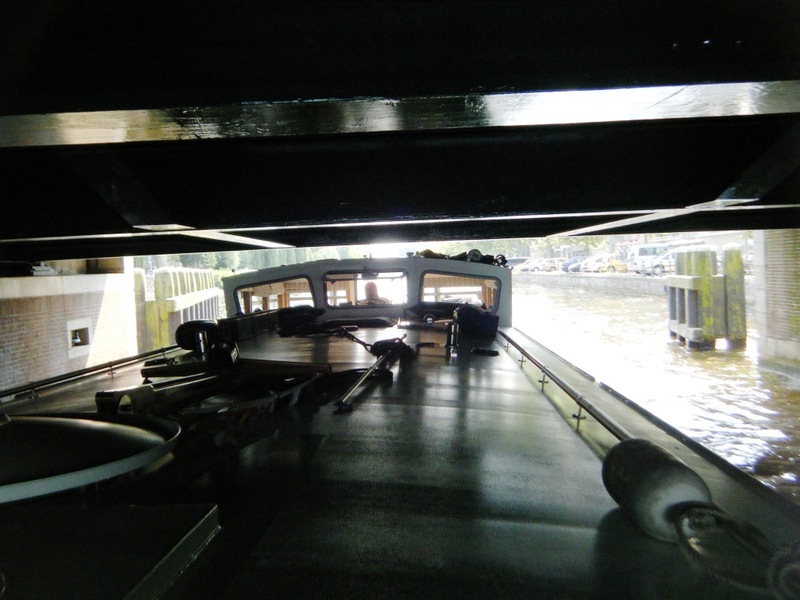 In our view the trip from Paris to Weesp is the key to success in the boat repair and maintenance department. Marco de Bruyn and his fantastic team, in particular Tyse, are the ultimate professionals: they start with the problem and come up with a solution before taking action! They are fast-working and efficient once we agree a solution and their work is all high quality. Every task is thoroughly tested by Tyse and then Marco himself comes for a final check, a quality control routine missing from many boatyards. We also find we laugh together, they share our sense of humour, and enjoy having them around. See our notes (tongue in cheek) on mechanics: in the past we’ve had our challenges. 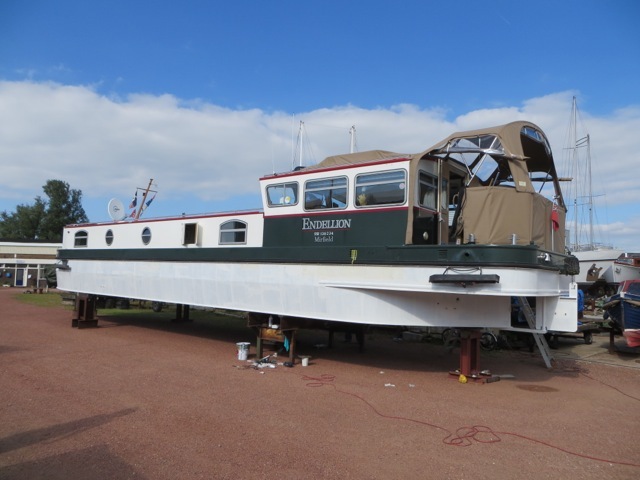 Paul’s photograph of Endellion looking very odd with a white bottom, soon to be black with anti-foul over the primer. We love Weesp although Stewart hasn’t been able to get off the boat for almost a week (being up in the air on blocks). This is where we do our personal repair work too, ie, we visit the Dentist and Doctor, they’re amongst the best we’ve found anywhere in the world! We have a few favourite cafes (Meyers, Eeterij De Schalkse, Minevitus) and delight in the Indonesian take-away. 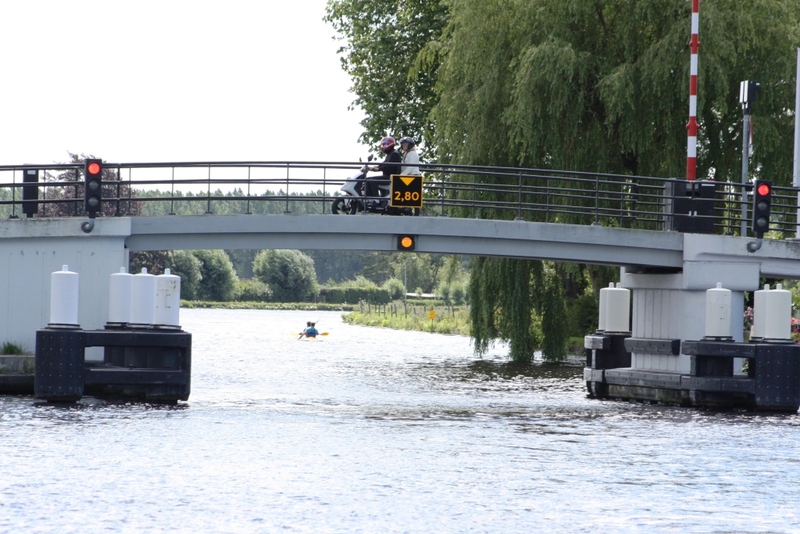 The classic toll bridge, the clog flies out on the end of a fishing line, pop the EU3 (three euros) inside and the bridge keeper pops it into the kitty and swings it again to the next boat. 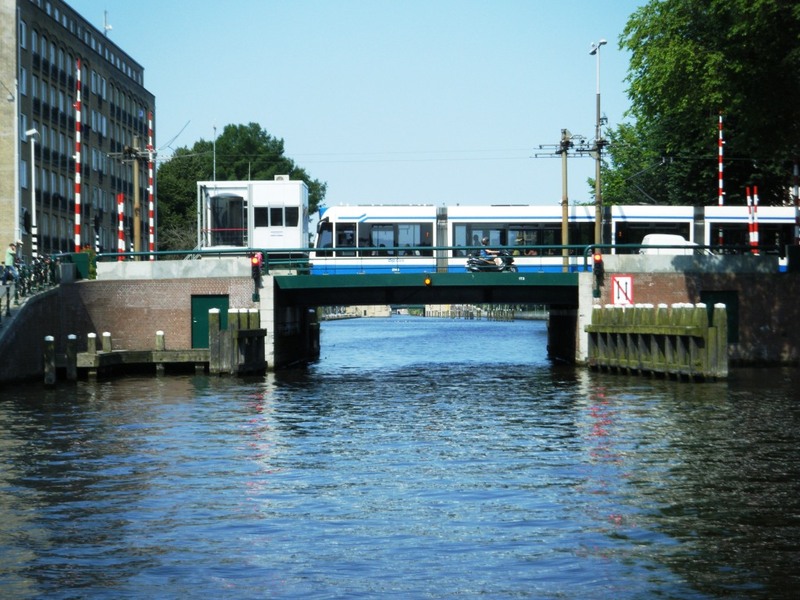 We love to sit and watch the boats coming and going through the heart of town under the lift bridges and paying their toll into the clog.. and soon it will be us going through and paying our toll. Happily for us (and especially for Stewart not being able to get off the boat) his school friend Paul and his wife Kien visited us from their home in Amsterdam. Paul, Stewart and Kien on board Endellion loving the Champagne and sharing memories of old Canberra days. For them it meant climbing up the shaky ladder set up for us in the boatyard and tolerating the sanding and grinding machines going on around us .. and the smell of paint coming from beneath us. Good times discussed with more on that in our next blog (Canberra features). We’ve had great weather for painting, sunny and dry, but it will be wonderful to be back in the water .. hopefully in the next few days. We’re now almost up to date with our blog! It took this long stay in a boatyard to get the photos and words together. This entry was posted in Accessibility, Waterway life, Waterway services. Bookmark the permalink. Must have cramped your style staying on the boat for a week Stewart! Another great post.